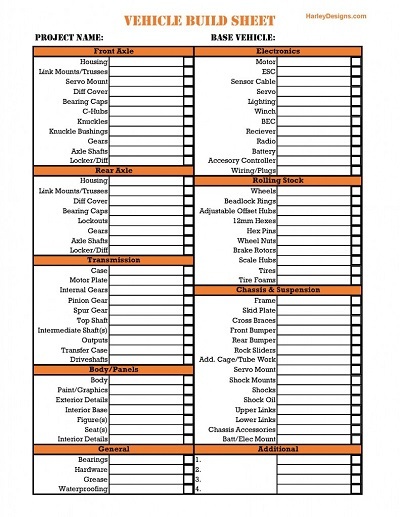 I recently had my buddy Howard ask me to come up with a checklist for builds. I got to thinking about it and figuring out how to make it convenient for new builds, in progress builds, and completed builds. So I went through and listed all I could fit on one sheet with editable spots for user input. I also added a check box to use as you wish, for me I think I'll use it as a "Have It" box. I suggest downloading the Adobe Acrobat app on your mobile device, you can fill it out and save it right from your phone or tablet. Post up any comments are thoughts, but remember I have very limited space to fit this all in on one sheet of paper. The only thing I added to it was a place to record my wheelbase. Going to fill one out for all my trucks. But on the topic of price, I could add a field for the price and have a box that automatically summed all of them up. The issue is that if I do that, I am cutting space away from the text fields which may already be getting cramped. How important is it to see cost to everyone? What's this budget word you speak of? Right, and I can clearly see the benefit of having it. I guess I just really need to find the space. Yeah now that I said that and looked again, there really isn't room after you fill it out with the info. I don't know about everyone else, but I absolutely want no record of what my builds cost. First off it would probably scare me, but mostly if the wife stumbled across it she would have a come apart. I already make my own lists of costs (surpised how little I actually have into my JK8 compared to what I thought where it would be. ) and some of the lines are cramped on the one I filled out before the check boxes were added. Sections to put link lengths would be cool if they would fit. My same thoughts echoed perfectly. I still stand by my rigs being about $300-$400... no matter what it costs to get there. As Im a "returning" r/c:er,(I did alot of rc in the 80's) I will use this for my coming scale crawler build. 1:1 car/truck/rockracer or even pics. Thanks Harley I will defiantly be using this. Very nice contribution to the community Harley. Seems a bit too fancy, I'm used to scribbling my ideas down on napkins from the lunch room. I've been thinking about trying this paper I hear so much about. However, skipping that step and having a .pdf on the phone might allow me to keep track of my napkins... err project ideas. Last edited by Postclanker; 11-26-2015 at 10:54 PM. And I think you're correct! How much we spend on them and how much they're worth have very little correlation. Most modified rigs have a value in the $300-$400 range, while the money spent to get there is typically some 2-5 times as much. Personally I got into the hobby of leather work this autumn and have tried to keep track on every expense. It's interesting to see how much of the costs go into each of the categories tools (33.1%), material and consumables (leather, dye, glue, thread, rivets, etc.) (48.7%), media (books, patterns, etc.) (6.9%) and shipping (11.4%). It's scaring to see the actual amount of money invested though , but at least I now have a decent set of "lifetime" tools and a good stock of material to make just about anything I want!